I'm sure you can guess why I chose this theme for my booklist this month! We are getting ever closer to meeting our baby girl and we can hardly wait! Now that the move is behind us, she can come anytime. Since my babies have never come early, though, I am not expecting it to be any earlier than my scheduled C-section at the end of this month. Most of these books are geared toward older siblings, to help ease the transition to a new baby. A few of them simply celebrate babies in general. I hope you can find some that fit your family's needs! When Mother and Father make a surprise announcement--that a new baby will be coming in about 6 months--D.W. is thrilled and Arthur is uncertain. His friends have all kinds of advice and warnings for him. When Baby Kate makes her appearance, it takes Arthur a little while to warm up to her, but then he discovers she's okay. 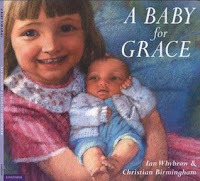 Many picture book series have similar titles, for everything from new baby like this one, to starting school, losing a tooth, moving, etc. For kids already familiar with the characters, it adds a layer of reassurance--like listening in on the way some good friends handle the issues they might be facing. That is, as long as you as the parent are okay with how the characters handle it! 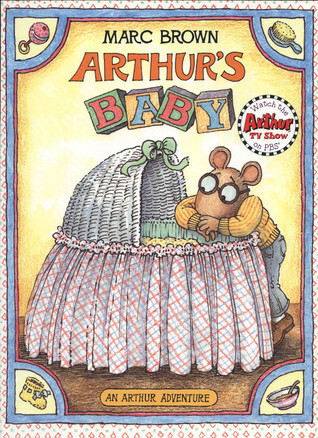 I appreciated how this one showed 2 different perspectives--with both D.W.'s and Arthur's reactions to their new baby sister. I also liked that neither one was openly antagonistic or said mean things. D.W. was very positive, if a little bossy and over-enthusiastic, while Arthur was more just hesitant. This one gets my stamp of approval! Grace wants to be big and help, but everyone correcting her and telling her "No." When her new baby brother comes home, it gets even worse. After her attempt to cut some flowers for the baby (with the super sharp shears) is curtailed, all of her hurt feelings come out. Finally, Dad gives her the little bit of help and attention she needs for her good intentions to finally get her the praise she so desires. Poor little Grace! At least it ends on a reassuring note. This book made me think about my own parenting and how often I say "no" to my kids. A good reminder for the grownups reading the story that older siblings will need a little extra attention and patience when baby comes home. The illustrations were all done in softened--almost blurred--lines. I can't tell what medium was used, but it adds a welcome gentleness to the story. The adults are not harsh or snapping at her, just giving her lots of guidance. 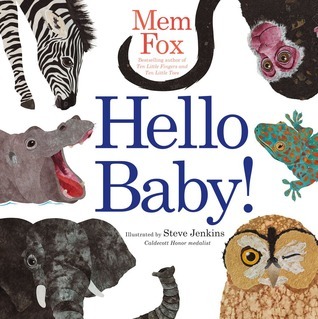 The book starts out with, "Hello, baby!...Who are you?" then shows all sorts of animal babies, one per page. At the end, we find out who the most treasured baby really is. With Steve Jenkins' signature cut-paper illustrations and one short sentence per page, this one will probably be a hit with the younger crowd. As a read-aloud, expect your kids to answer on every page! 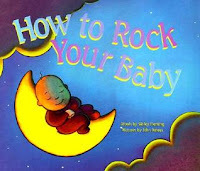 New baby comes with an instruction book for diapering and feeding and even burping, but when it comes to rocking all it says it, "Now rock the baby to sleep." The father and the mother come up with lots of ideas for rocking the baby, including a ride in the car and a cricket lullaby, but nothing works! In the end, the mother decides to just do it herself and the baby drifts off to sleep. Illustrations in sleepy blues, purples, and greens, are just right for this whimsical story. Older siblings may enjoy knowing more than the mother and father on this one! Little Rabbit is determined to help the new babies (triplets) eat and play, but they don't know how to do anything! Then he gets in trouble for making a mess and making them cry. All Mama and Papa think about anymore are those babies. So then he gets cranky and possessive--which of course doesn't help either. 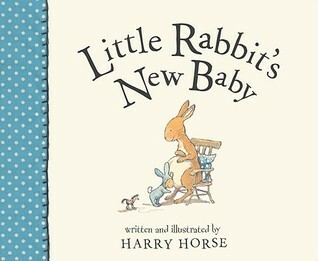 However, when the babies simply won't go to sleep no matter what the grownups try, it's Little Rabbit who saves the day. Charming illustrations done in pen and ink and watercolor make life in the burrow seem to be a cozy place, just right for raising little bunnies. Lola loves to read stories with her Mommy. When her new little brother comes along, she finds just the right story to read to him in every situation. She's a great helper. 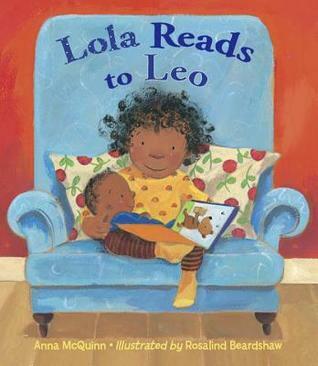 By the end of the day, it's Lola's turn for a story! I really liked that Lola accepted and was kind to her baby brother from the very beginning. Many of the books in the genre are geared for older siblings who are having a hard time with the new arrival. It's nice to come across one that does not have that as its basic premise. Also, how can I not like one all about a big sister reading to little brother? :) This book is 3rd in a series about the book-loving Lola. If you're looking for a book with a bit of diversity, the family shown is African American. All about the wonder of a new baby, as told to a young child, with the repeated refrain, "...we loved you." This is a sweet little book. Each 2-page spread includes one stanza of the song or poem, plus a full-page illustration on the facing page. May prove to be reassuring to an child about to become an older sibling for the first time, or just to let a little one know how much they have always been loved. Plus, if your little one loves pictures of babies, they'll be in heaven with the illustrations! 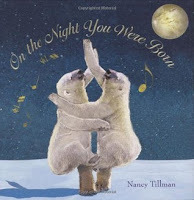 On the night you were born, all of nature rejoiced because of how special you are. Short text on each page, paired with a full-page illustration conveys the sweet message that each baby is precious and unique. 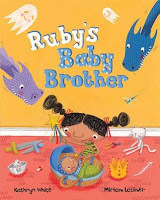 At first, Ruby is worried and scared when her new baby brother Leon comes home, but once she holds him she knows everything will be all right. In fact, she immediately begins to come up with all sorts of games for them to play together. Ruby's imagination sparkles in this addition to the genre. She imagines changing baby brother into a bat at first, then thinks maybe he is an elf that will change her into a mouse. Once she realizes he will be a friend, she imagines up all sorts of fun scenarios for the two of them. Each day of the week is a day to give babies away to happy mothers. Some want one, two, or three. One even thinks "seven is heaven!" According to the author's note at this end, the idea for this book was a popular song from the 1960's. That makes sense. It's a short read, with a catchy rhythm to it. Priceman's illustrations add a loose, flowing quality to it. Don't think too hard about the reality of adopting that many babies all at once, and it's all good! My 5-year-old enjoyed it. 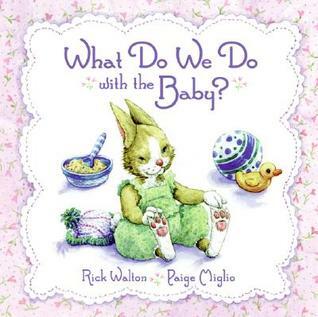 Starting off with, "What do we do with the bunny? What do we do with the baby?" we go through moving with the baby (and bunny), feeding them, cleaning them up, and so on. Illustrations show a charming family of rabbits taking care of their baby bunny, as the text first asks a question about taking care of a baby, then answers it, all in a rhythmic refrain. 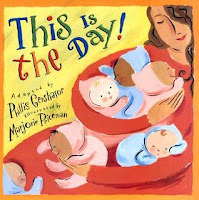 A gentle introduction to having a baby around, with no sibling rivalry to speak of. 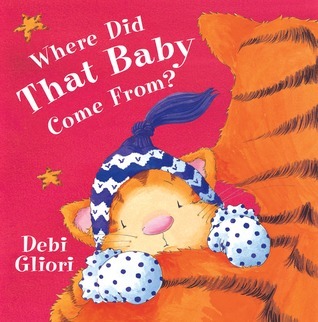 A tiger wonders where the new baby could possibly be from: the sky? A seed? The store? Or perhaps the zoo? Can we please set it free? Written in rhyme, with a stanza per page. This older sibling is not impressed with the baby--it leaks, it's messy, etc., and wants it to go back wherever it came from. At least, until the baby cries; then a protective streak is awakened in bigger sibling, who gets baby to laugh. The illustrations have a smaller picture inset showing what's happening that has prompted that page's musings, with imagined origins of the baby filling up the entire facing page. 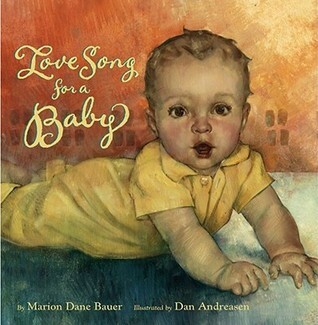 Do you have a favorite book about babies? Tell me, please!